Curator's note: This poster was printed for the first national elections in the newly created state of Israel, in 1949. The upper image is of an armed British soldier menacingly waving the British flag and standing before barbed wire and several tanks. He symbolizes the British role in complicating or preventing the immigration to Palestine of European Jews fleeing anti-Semitism and, after the rise of the Nazis, the Holocaust. 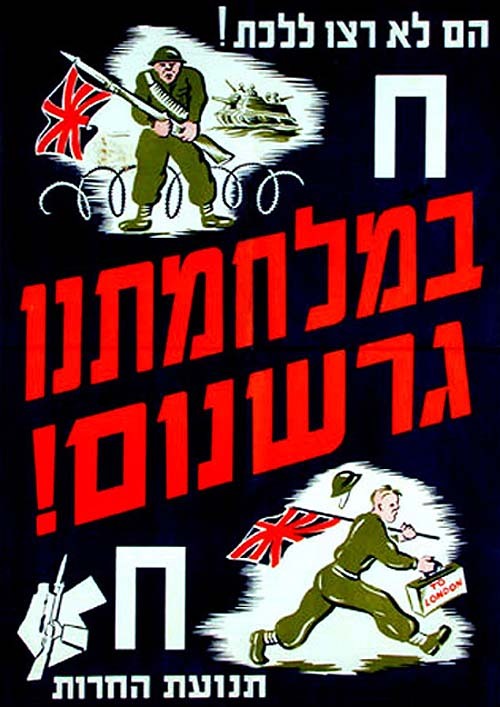 In the lower image the soldier is himself fleeing having dropped his weapon and grabbed a valise marked "To London", ostensibly as a result of the Herut Party's pre-independence sabotage and anti-British militia activities. The logo of the Herut (Hebrew: freedom) party in the lower left hand corner, featuring an upright rifle in a clenched hand, signifies the party's embrace of armed struggle. Its outline evokes the geographical area not only of Palestine (the land mass west of the Jordan River), but also Transjordan (present day Jordan), which the Zionist Revisionists insisted were the actual boundaries of their nascent Jewish state.